RICKY HATTON was reunited with old foe Kostya Tszyu for the first time since their epic 2005 battle at the weekend. ‘The Hitman’ enjoyed his finest moment when he won the IBF light-welterweight title by forced the world class Aussie to retire on his stool in front of 22,000 fans at the Manchester Arena. Nearly a decade later both boxers still have immense respect for each other and warmly embraced when they met up at press conference in Sydney to promote the upcoming fight between Hatton’s fighter Sergey Rabchenko and former three-time world champion Anthony Mundine. “It’s the first time I’ve seen him since we fought and it was certainly a lot less painful than when we boxed,” Hatton joked. “I still believe it was my greatest win. He’s one of the best light-welterweights of all-time and although I did break a few Australian hearts that night, the way me and Kostya conducted ourselves after the fight was a good example to the youngsters. “It was a wonderful fight and it couldn’t have been more physical. We both landed heavy shots, but the way he conducted ourselves was just as important as the actual fight. Tszyu, who retired after that ferocious tussle in Manchester, is now a businessman living in Moscow. He admits that losing his title that night made him consider his future in the sport and he has no desire for there to be a Hatton v Tszyu 2. “I remember everything [about that night],” he said. “It was a memorable date for me because it made me realise that I had something else in my life other than boxing. Thank you Ricky for that. “As Ricky said, the way we conducted ourselves after the fight was a good example to the younger generation because what happens in the ring is one thing and afterwards is different. “What happened was properly not what I expected but that is life and it was time to move on and see what was next in my life. I’m enjoying myself. 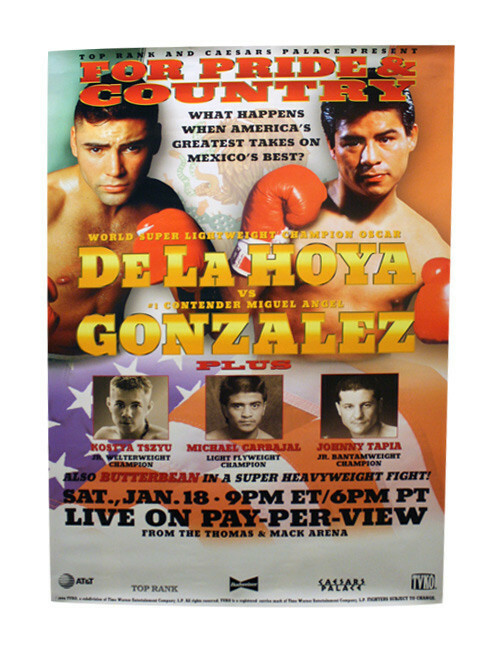 In 1996, HBO launched a new boxing series which was a spinoff from it’s World Championship Boxing program. It was called HBO’s Boxing After Dark. The bouts were televised later in the evening around 10 or 11 PM EST. It was a program for young, up and coming talent to be showcased and the main events were evenly matched bouts in which either fighter had a chance to win. 1997 was probably B.A.D.’s biggest year and probably the most exciting bout that year was a Jr. Welterweight championship bout between unbeaten champion Kostya Tzsyu and hard hitting “Cool” Vince Phillips. Kostya Tszyu was one of the hottest young champions in the sport of boxing. He had power in either hand, knocking out 14 out his first 18 opponents. His Russian, Korean and Mongolian heritage gave him a rather unique look as he resembled somewhat of a kung-fu star, sporting a Mongolian style, braided tail. Vince Phillips was very exciting boxer-puncher who loved to mix it up. He had a major league right hand, which was probably the hardest right hand in boxing at that time. He was a seven year veteran who was 31-1 with 22 KO’s when he challenged Ike Quartey for his welterweight championship in April of 1996. He gave it his all and threw everything he could at Quartey for three rounds before being stopped. Nine months later, he appeared on Boxing After Dark, losing a close split decision to 1988 olympic gold medalist Romallis Ellis in which Phillips was a late substitution for former world champion Christano Espana. After fighting those bouts at welterweight, Phillips decided he would move down to Jr. Welterweight. In the spring of 1997, Oscar De La Hoya vacated his WBC Super Lightweight title and fellow Mexican warriors Julio Cesar Chavez and Miguel Angel Gonzalez were scheduled to fight for the vacant title. Kostya Tszyu was hoping to meet the winner of that bout and unfify the 140 lb division as well as meet up with Oscar De La Hoya some time down the road. In order to do that, he first had to get past Vince Phillips. They met on 05/31/97 at the ballroom at the Trump Taj Mahal in Atlantic City, NJ and it was for the IBF Jr. Welterweight championship. Phillips walked out of the dressing room to the song “I believe I can fly” by R. Kelly and he sported a welt underneath his right eye that he suffered during sparring. When Tszyu made it to the ring, he put both gloves on the top rope and jumped into the ring. In the first round, both fighters had their moments, getting in some good shots; however it was Kostya’s round. Tszyu was very relaxed and confident inside the ring as he stood back and picked his shots. Phillips showed a little more movement as he used his jab to setup his right hand. Tszyu would dominate the second round as the left hook got going and he was able to land it at will. Although Phillips lost the round, he was still able to get in a right hand or two and it was getting Tszyu’s attention. The pace increased in the third round as both men exchanged hard shots, all with the intention of getting the other man out of there. There was also a battle in the stands as a portion of the crowd chanted “U.S.A., U.S.A” in support of Phillips and the Tszyu fans countered with there own chant of “Tszyu! !, Tszyu! !” The fourth round was more of the same as both men continued to trade hard shots. Phillips began to work the body very well and his right hand was finding its mark; however Tszyu was walking through Phillips‘ shots and countering with his own power shots. The action continued in both the 5th and 6th rounds. In the seventh round, the tide began to turn as Phillips would land a 1-2, left, right combination that put Tszyu on the canvas. Tszyu was on his feet almost immediately; however it was a momentum boost for Phillips. The two men would stand in the center of the ring in the eighth round and trade hard shots. Both men looked tired, but they kept firing. Phillips‘ right hand was still finding its mark and Tszyu continued to counter with his own hard shots. In the ninth, Tszyu landed a left hook that opened up a bad cut over Phillips‘ right eye. Referee Benji Esteves called time and had the ringside doctor take a look at the cut. The doctor said the cut was ok and the fight resumed. Phillips wasted no time as he began to go for the kill. He was getting the better of the exchanges and it looked like he was wearing Tszyu down. Larry Merchant, who was calling the fight ringside said, “Now we know what World War III would have looked like”. In the 10th, Phillips landed a hard right hand that buckled Tszyu. Seconds later, he would land another right hand that buckled Tszyu again and sent him reeling against the ropes. Phillips went in for the kill and landed five or six hard unanswered shots that had Tzsyu out on his feet and helplessly dazed, causing referee Benji Esteves to step in and stop the bout. After 8 long years, Vince Phillips was finally a world champion. Jim Lampley and Roy Jones Jr. were ecstatic as they cried “Yes! !, Yes! !” It was 1997’s Upset of the year and Comeback of the year by Ring Magazine. Phillips would make his first defense just two months later against Lowell, Massachussetts’ “Irish” Micky Ward. Ward earned this title shot after a come from behind KO win over Mexican Alfonso Sanchez in which Ward lost every minute of every round before landing a hard body shot in the 7th which put Sanchez down and out. He would get a shot at Phillips‘ title which was an event that was omitted in the 2010 movie “The Fighter” starring Mark Whalberg. Vince was successful in his first title defense by scoring a third round stoppage of Ward due to a cut caused by a right hand. Phillips would successfully defend his title twice more, both by KO before losing to Terron Millett in 1999. Phillips would continue fighting for the next 8 years, going 9-8-1 with 5 KO’s. His record as a professional stands at 48-12-1 with 34 KO’s. Kostya Tzsyu rebounded well from this loss and would win another world title 18 months later when he stopped Cuban Diosbelys Hurtado. He would rack up 13 straight wins, unify all three major Jr. Welterweight title belts and would beat top notch opposition such as Miguel Angel Gonzalez, Julio Cesar Chavez, Sharmba Mitchell, and Zab Judah. He ruled the 140 lb. division for seven years before losing to Ricky Hatton in 2005. He retired with a record of 34-2-1 with 25 KO’s. In 2011, he was inducted into the International Boxing Hall of Fame. The 1997 clash between Kostya Tszyu and Vince Phillips was only a small bump in the road for Tszyu, who went on to have a hall of fame career. For Phillips it was his crowning achievement that he strived so hard to reach. He was a fighter that wasn’t going to be denied on that night. The word “can’t” just wasn’t in his vocabulary. Mexico has a very rich boxing tradition. The fighters and fans take great pride in the sport and Mexico has produced many hall of famers over the years. The most famous Mexican fighter is without a doubt Julio Cesar Chavez. He ruled the 140 lb division for many years and notched over 100 victories in his career. During the mid to late 90’s when Chavez was on the decline, there was another fighter who yearned for respect while hoping to have the torch passed down to him as Mexico’s next great champion. His name was Miguel Ángel González. González was a very tough technician with great skill and technique who made a name for himself amongst the elite of Mexican fighters throughout the 90’s. González was born and raised in Mexico City, Mexico and took up boxing at age 15. As an amateur, he had a successful record of 63-3 while representing Mexico in the 1988 Olympics in Seoul, South Korea. He made his professional debut in January of 1989 at the age of 17 and would score a fifth round TKO in his pro debut. In 1990, he would relocate to Tokyo, Japan and would fight on the Japanese circuit for about a year in which he would earn the moniker “Santa Tokyo”. He would win his first 25 fights, 23 by KO before fighting for his first world title. He would face Columbian challenger, Wilfrido Rocha on 08/24/92 in Mexico City for the vacant WBC lightweight title. It was an exciting fight in which González was in trouble early, being knocked down in the second round, but was able to weather the storm and take control in the middle rounds. In the ninth round, González was able to cut Rocha and the fight was stopped in the same round due to the cut. It was a great win for Gonzalez, who joined the list of world champions hailing from Mexico. González would successfully defend his title 10 times over the next three years including KO victories over future world champions Jean-Baptiste Mendy and Leavander Johnson. After winning a very close majority decision over Lamar Murphy on the Mike Tyson vs Peter McNeeley undercard in August of 1995, it was then decided that Gonzalez would move up to Jr. Welterweight. After winning three fights at Jr. Welterweight over the next year, González was in line for another title shot, this time against the “Golden Boy” Oscar De La Hoya. The fight was billed as “For Pride and Country” and they met on 01/18/97 at the Thomas and Mack Center in Las Vegas for the WBC super lightweight championship. 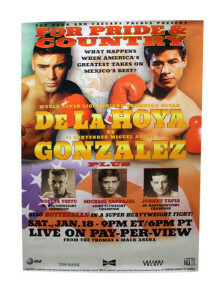 The fight was dominated for the most part by De La Hoya’s agression with his piston-like jab and left hook. González held his own with the “Golden Boy” by landing his own jab and left hook with much success. He even busted up De La Hoya’s left eye, causing it to swell badly. The end result would be a 12 round unanimous decision for De La Hoya. De La Hoya would move up to the welterweight division and would vacate his super lightweight title, putting González in line for another title shot, this time against Mexican legend Julio Cesar Chavez. They met in front of a huge crowd of over 50,000 fans at the Plaza de Toros in Mexico City on 03/07/98. The huge crowd was mostly there to support Chavez, despite González being the hometown fighter. It was an unusual night as the lights went out moments before the two fighters were set to walk out to the ring; however they were restored shortly after González made his way into the ring. González controlled the first half of the fight by using his jab to setup combinations and avoiding dangerous exchanges with the very dangerous Chavez. González frustrated Chavez early on, causing Chavez to resort to dirty tactics such as using his elbows and forearms as well as landing low blows. Chavez began to come on the seventh round by landing hard shots and he dominated in the same fashion in the eighth round. In the eighth, the pro- Chavez crowd was starting to get frustrated with the fight and began throwing debris into the ring. González regained his composure in the ninth and took the round by once again outboxing Chavez and avoiding exchanges. The 10th and 11th rounds were very close in which Chavez would come racing out to land hard shots and attempt to steal the rounds by flurrying in the last 10 seconds of the round. González knew he needed a big 12 round and he went out and closed the show like a champion, using his jab and landing combinations. It appeared as if the torch was close to being passed as the final bell sounded. It was clear that González did enough to win the fight and in a perfect world he deserved the decision and the championship; however the judges had the final say. One judge scored the fight 115-114 for Chavez, another scored it 116-114 for González and the third judge had it scored even at 115-115 making the final decision a draw. The pro-Chavez crowd was very upset and began throwing cups and seat cushions into the ring. Chavez, who wasn’t known for giving his opponents credit, had a moment of humility afterwards. He said that the fight was very close and González fought a very good fight. He also said he had a hard time making the weight limit of 140 lbs and he wanted a rematch. After the disappointing decsion in the Chavez fight, González split from promoter Don King and signed with America Presents. After winning his next fight by KO, González was once again in line to fight for the vacant WBC super lightweight title, this time against the very hard hitting Kostya Tszyu. They were scheduled to fight on 11/28/98 in Indio, CA; however due to an injury 10 days before the bout, González was forced to withdraw. Instead, Tszyu faced Cuban Diosbelys Hurtado and claimed the WBC title by fifth round TKO. Although Tszyu was now the interim champion, he was still obligated to face González. After once again having the fight postponed due to contractual disputes with promoters, the two finally met on 08/21/99 in Miami, FL. González was coming off of a 14 month layoff and the ring rust showed inside the ring. The two fighters collided heads in the first round which caused a cut over González’s eye. González, frustrated by the headbutt, began resorting to dirty tactics such as intentionally headbutting Tzsyu as well as hitting with his shoulder. Tszyu dominated the fight by landing hard shots such as his straight left hand. After taking punishment for 10 rounds, González’s trainer Abel Sanchez finally stopped the bout. González would be inactive for 14 months and he would return to the ring in December of 2000 in which he scored a first round KO over Alex Lubo. He would then suffer another setback three months later as he dropped a very close split decision to fellow Mexican Manuel Gomez. He would be out of the ring for another 14 months and would return in May of 2002 in which he would win five straight bouts all by KO before getting another shot at a world title. This time he met Cory Spinks for the “Undisputed” welterweight title. They met on 09/04/04 at the Mandalay Bay in Las Vegas, NV. González gave a good account of himself in this bout; however Spinks was at the top of his game and outboxed González en route to a lopsided unanimous decision victory. Despite losing, González would get another title shot in his next fight against WBA welterweight champion Luis Collazo in August of 2005; however he would lose on an eighth round TKO. It was the end of the road for Miguel Angel González as a serious contender although he would fight twice more in 2006, winning both bouts. He retired with a record of 51-5-1 with 40 KO’s. There were talks of González making a comeback in 2012; however it never came to fruition. It’s unfortunate that Miguel Ángel González didn’t get the level of respect that he deserved. He fought during an era in which Mexico wasn’t ready to let go of their hero Julio Cesar Chavez. It is also unfortunate that he fought during a time in which a new generation of Mexican fighters such as Erik Morales and Marco Antonio Barerra were beginning to stamp their name amongst the Mexican elite. Although González didn’t reach the stature of Chavez, he will always be remembered for his skill, heart, determination and class. He forever remains another of our “Unsung” heroes of the prize ring.